Last week, I wrote about Toronto-born Joe Votto and called him "the best Toronto-born ballplayer since Rob Ducey". Right on cue, here's Robert Thomas Ducey. 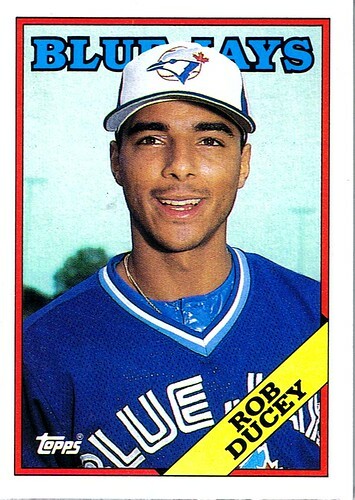 Ducey was a utility outfielder who played in Toronto between 1987-1992 and again in 2000. He was used sparingly, never getting more than 76 at bats in any one season for the Jays, but he actually had a pretty long major league career. He played in the bigs from 1987 until 2001 and he was a designated hitter for Team Canada in the 2004 Summer Olympics. Here's an interesting Rob Ducey tid bit from the 88 Topps Card blog. Ducey was involved in a strange set of transactions in 2000. The Phillies traded him to Toronto on July 26 for minor-leaguer John Sneed. Then, on August 7, he was traded back to the Phillies for Mickey Morandini. Morandini himself was returning to the Phillies, who had previously traded him away to the Cubs for Doug Glanville. Weird.